Calvin’s theology is one that is distinctly “Reformed” and quite rich in its content. Many thinkers and theologians since the days of Calvin have written numerous volumes in an attempt to delineate Calvin’s theology. However, as one nineteenth century Calvinist scholar describes, “No servant of Christ, probably since the days of the Apostles and of the Gospel witnesses of their century, has been more grossly misrepresented or more maliciously maligned than the faithful, fearless and beloved Calvin.” (Henry Cole, 1855). If Cole is correct, which in many respects I believe he is (especially today), then it seems incumbent upon both professional theologians and lay theologians alike to pay closer attention to what Calvin himself is actually espousing. Too often I read contemporary works that deal with John Calvin’s theology only to discover that the author’s research includes secondary works (works about Calvin or Calvin’s thought) about Calvin and no primary works (actual works by Calvin) are used. There is nothing actually wrong with consulting other theologians about John Calvin’s theology (and anyone else’s for that matter). But to do this at the expense of consulting the actual works of John Calvin (and anyone else’s for that matter) can be and often is detrimental to the end result of attempting to understand Calvin (and anyone else for that matter). The point is if we want to really understand what Calvin taught, we should begin with the works of John Calvin. 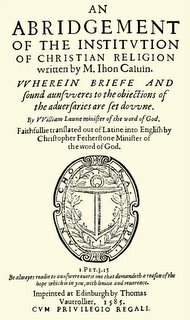 It is to this end that I will attempt to cover certain doctrines from Calvin’s work over a lengthy period of time and post them here for all to read. Let me declare upfront that I am not attempting in any fashion to exhaust Calvin’s theology. This medium (i.e. blogging) could never actually allow such a task, since it seems that by definition, blogging is simply logging thoughts in short formats so others can read and respond. However, I am hoping that the short ‘reviews’ or descriptions of Calvin’s theology which I will post here will serve a twofold purpose. First, I hope it will cause you the reader to take up Calvin’s actual works and read them. Second, I hope that it will cause you the reader to react by responding to my posts which will spark discussion among other readers here. And that these discussions will cause you, the reader, to take up Calvin’s actual works and read them. In short, purchase Calvin’s actual works and read them, since it is by doing that that you will gain a better understanding of Calvin’s Calvinism. So pull up a chair, grab your favorite beverage, smoke ‘em if you got ‘em, and let’s discuss Calvin’s theology from Calvin himself. 1) The knowledge of God as creator and God as redeemer. Each of these issues will probably require multiple posts so you can see why this series may take some time. While I will be using several different works by Calvin, the main thrust of my posts will stem from Calvin’s magnum opus titled The Institutes of the Christian Religion. The translation I prefer of the Institutes is Henry Beveridge’s, so it will be the one I employ. 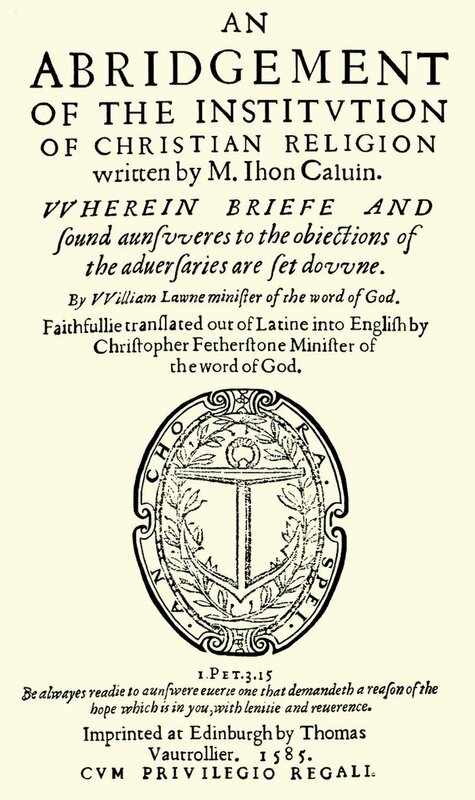 5) Calvin’s Calvinism: Treatises on the Predestination of God & the Secret Providence of God translated by Henry Cole. This is a two works in one book. Cole translates two of Calvin’s treatises which up to that day, 1850’s, had never been translated into English). These are a few to get you started. Once again please post any recommendations of other works in the comments section. I hope you enjoy and benefit from this series. Hey there! I wonder whether you've ever read Calvin's "Short Treatise on the Lord's Supper?" I think it is contained in a book also by J.K. Reid on Calvin's treatises. And if you have read it, I'd like to get your thoughts on it. Calvin's comments on this issue seem to me to be very far away from a view toward the Eucharist that would assert "it's merely a symbol." His view, it seems to me in my immature readings, could almost properly be called a "real presence" view, though not a "transubstantiation" view. Have any thoughts on this you'd like to share in future posts? I'd like to see your reflections on this or any view he has on sacramental theology. It seems to me that he and Luther both had a higher view of the sacraments than do contemporary Calvinists or Lutherans, and this seems a shame. Actually I will cover the issue of the sacraments when I get to Calvin's ecclesiology. 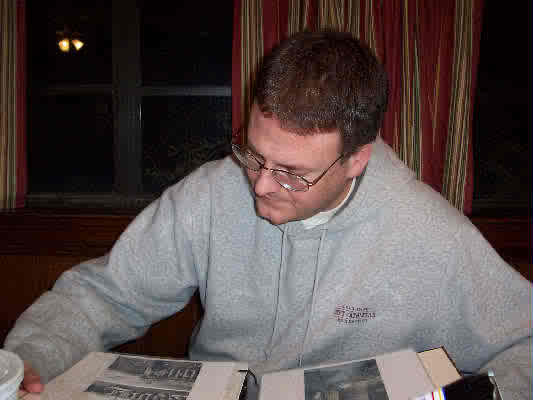 But thanks for asking, and yes, I do have that book and the treatise on the Lord's Supper is in it. I agree about the Beveridge translation of the Institutes -- it captures the rhetorical flavour of the Latin much better. For an accurate general picture of Calvin, I reckon it's also vital to read some of his commentaries and expository sermons, since he devoted the vast majority of his time and effort to exegesis, not to theology. Even the Institutes was really written as a handbook to help readers of Calvin's commentaries. very true, especially sine that is the bulk of his work. However, I will certainly get them again soon. Sold the commentaries! Oh, poor chap. But you could probably find them online now I guess, at ccel.org or somewhere like it. Sorry I'm a bit behind on your posts, I've just been catching up. This looks like a great series, looking forward to it. Regarding the commentaries, they are online, but I am 'old school' it is far better to have the actual books there for me to "use" and "see" on my shelves. There is a greater aesthetic quality to actually having the books as opposed to looking at the content on some computer screen (when it comes to the actual books vs. online anyway). I know that CBD now has a complete set for $150.00, so I will probably order those here real soon. Yea, I know what you mean. Some years ago I was preaching a series of sermons in a Reformed church, and a member of the congregation asked me if I would like his old set of Calvin's commentaries, which he no longer used. As a poor penniless student, I was especially grateful!